“Of course there are a number of things that I like in health care reform that I’m going to put in place,” he said in an interview broadcast Sunday on NBC’s Meet the Press. ”One is to make sure that those with pre-existing conditions can get coverage.” Romney also said he would allow young adults to keep their coverage under their parents’ health-insurance. Under normal circumstances, I’d write a long post about how ridiculous this is. If you guarantee that people with preexisting conditions can get coverage, people will game the system by getting coverage only when they get sick. To avoid that, you have to create a stable risk pool for insurers by mandating that everyone maintain coverage all the time. And if you have a mandate, then you need to subsidize poor people, which in turn means you have to have a funding source for the subsidies. More here. Like I said, that’s what I’d do under normal circumstances. But host David Gregory didn’t bother asking Romney about any of these pesky details, and I guess I can hardly blame him since Romney wouldn’t have answered. This is just another one of Romney’s secret plans, like which tax loopholes he’ll close, how he’ll win the war in Afghanistan, and who will pay the price if Medicare costs rise faster than his growth cap. Romney has diligently refused to answer any of these questions, and he’s even been fairly honest about why: if he explained all this stuff, some of the answers would be unpopular and the Obama campaign would point that out. So that’s that: in Romneyland it’s ice cream sundaes all day long. And their plan to hit the gym to work off the calories? No need to worry your pretty little heads over that. They’ll tell you about it later. 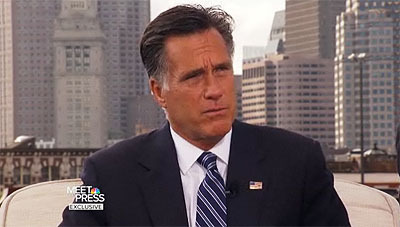 UPDATE: Unsurprisingly, a spokesman “clarified” Romney’s statement within hours. It turns out he doesn’t have any intention of making sure that people with preexisting conditions can get coverage after all. More here.